As designed by rg-architecture, the proposed Balboa Park development includes three (3) commercial storefronts fronting Ocean Avenue, an underground garage for 118 cars with its entrance on Cayuga, an 11,000-square-foot roof deck for residents, and a 9,000 square foot interior courtyard. 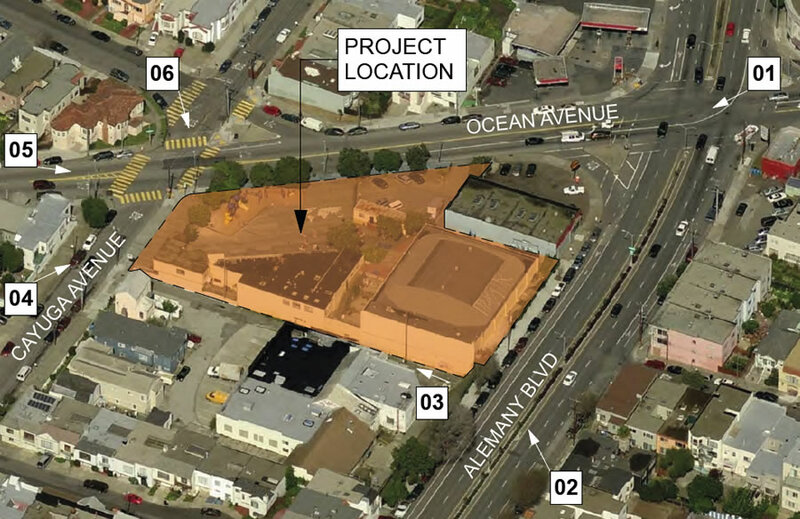 The development team isn’t planning to invoke the State Density Bonus Law to build above the 40-foot height limit for which the 65 Ocean Avenue parcel is currently zoned. And The Crayon Box is moving to 3215 Cesar Chavez Street. I’m not gonna lie, my objection to this is purely because prior to this being the Crayon Box it was the Discovery Center School, where i went K-8. Yes, housing is needed, but something hurts when its something like a school that disappears. Here’s hoping some significant provisions for parking are included since Cayuga is a very tight street, and Alemany isnt ideal for making turns of any nature. My SF parochial high school went out of business sometime in the 1990’s and the school building was purchased by the neighboring USF to become college classrooms. Many SF private Catholic high and primary schools have gone out of business or merged with other schools due to declining enrollment. Things change — it is okay. A school is just a building. Your former classmates are what made the experience special. Be grateful that investors still want to build and create in SF. Omg, when there are millions of dollars that will be made, would you not want to invest? I agree that schools should remain schools, as we are losing alot of spaces due to development. Yikes bikes! I live on Cayuga Ave 1 block down from the site of the proposed building. Cayuga, is indeed, a very narrow street which has mini-traffic jams for about 1 hour every school day when Balboa High School lets out. Cars are double-parked, pulling into or across the driveways of my building, etc. The proposed building has a large footprint, a big chunk of which would front on this already parking & traffic challenged street. (The congestion and driving habits on Cayuga also puts pedestrians and bike riders at risk.) I’m not sure what the answer is, but for now I had to go on record (at least on Next Door) that this could be a serious problem in the making. Does anybody know when public comments will be permitted and what stage this plan is currently at? My kids were in pre-school at Little Bear when the application was filed for this project. They are now going into sixth and seventh grade. I’m guessing they will be in high school by the time this is built. JK Dineen – an actual professional real estate reporter! Remember you from SF Business Journal, haven’t seen your byline in a while. You should keep commenting here, your experience should be shared. Thanks Frank C.! I’m at the Chronicle now, still covering real estate, although more big picture land use stuff that the sort of straight, transactional reporting I did at the Business Times. Of course I’m a regular reader of Socketsite and enjoy the (mostly) high level of discussion on the site. I’ll try to weigh in a bit more often! Interesting that they are asking for 1+ car space per unit (118 cars, 105 units), when this area is really well served by transit – BART, J, K, & M lines, 14X and 8X to downtown. Are they shooting for the Silicon Valley demographic that will drive down 280? And why so many cars unless many of the units will be 2-3 bedrooms? 105 spaces for residents, 13 shared spaces for the three stores. Makes sense, but why 1 per unit? Most other new developments are <1 per unit. So much for transit first! Because people have cars. If I were to pay an exorbitant amount for rent or mortgage, I’d sure as hell want a parking spot for my car and yes, I have a car in San Francisco. This is true. If you don’t have a car, are you even sure you’re a person? 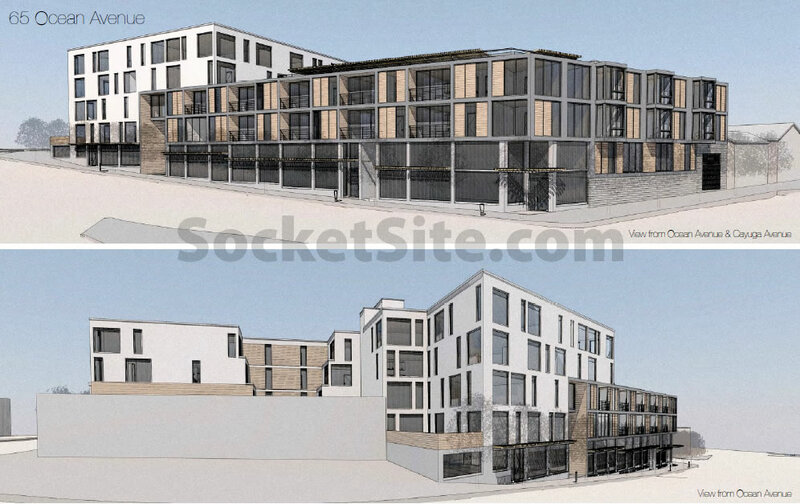 These plans have not yet been reviewed by the Planning Department — you can expect the parking to be reduced once they have been. This is a great plan. The triangle between Alemany, Ocean, Geneva and the Balboa Bart station could support much more density. Transportation infrastructure is there and shops and restaurants on Mission street could benefit. This is a prime location. It’s within just a few blocks of several major transit lines (including the Mission St buses and the Balboa Park Bart/Muni hub), it has immediate access to a plethora of shopping and cultural amenities up on Mission Street, and t’s very close to City College’s main campus on Phelan. To go downtown, the door-to-door trip time is under 30 minutes by Bart. Very convenient. Why only 105 units? There is no logistical or technical reason why the site cannot support a much larger building. Nimby’s can’t be the excuse either, not in this neighborhood. have you ever tried to exit off ocean during peak times? you know, when the traffic backs up all the way to monterey? yeah… thats why. I know this neighborhood well. With the combination of City College, Balboa High, and all the other schools, plus Bart drop-offs and freeway commuters, the traffic can get pretty bad. But that’s what I’m talking about, lack of vision. I’m not against this project, but I do take issue with the light tone (it just requires vision!) regarding improving traffic there. Any project there to improve traffic could involve multiple jurisdictions (freeway, city, BART). A friend worked for Caltrans. The project to change the interchange at 680 and 24 in Walnut Creek to add JUST ONE lane each, plus improve the on and off ramps took 10 years and cost $300 million, and that was 15 years ago and not in a dense area! Transportation infrastructure, even in seemingly small projects like this, are extremely expensive and resource-intensive. So it’s unlikely this would get done just to improve traffic for a relatively tiny private development. Whether this project can handle the increased traffic via public transportation remains to be seen. People will either figure out a personal solution or move away. We can’t build housing in places that would be convenient for transit access, because it would be too disruptive for car drivers. So people are forced to move to the places where they actually are building housing, which is to say greenfield developments dozens of miles away. So then you have a lot more cars from those developments, and more traffic… and so you can’t build housing in places that would be convenient for transit access, because it would be too disruptive for car drivers. “Nimby’s can’t be the excuse either, not in this neighborhood”? This is the same neighborhood that is trying to prevent a four-unit building at 1794 San Jose. Technically, in addition to being zoned for development up to 40 feet in height, as reported above, the site is principally only zoned for 68 units per the City’s Planning Code. And in fact, the project as proposed will require approval for a Planned Unit Development. Love when people say that it is great to have all of these shops in a neighborhood full of families and kids. Have you seen how bad it is to cross the street between Cayuga and ocean even with the stop sign? Every time they create shop and building, people forget the neighborhood. No I do not like the idea of a shop right in front of my house. You don’t want to live in an urban / walkable community with shops and services near your home? Are you for real? If that is your actual complaint, please move far far far from San Francisco where you can find an ideal residential-only community with no businesses nearby. Anon, why not a skyscraper? Are you for real? San Francisco is a major city after all. It is the center of a globally significant region with a population in the millions and gdp in the hundreds of billions, and this location is mere blocks away from a major transit hub, yet it’s been effectively a suburb with barely any substantial change or growth for the last 75 years. So seriously. Why not skyscrapers here? Is it because you *feel like* skyscrapers should never be in close proximity to single-family homes? Why not? Is it because you *feel like* some certain parts of the city should forever remain as obsolete relics of that brief period in US history when urban planners couldn’t comprehend the concept of future population growth? Can anyone come up with any reason at all that does not involve personal aesthetic tastes for how they *feel like* a neighborhood should look? Wow, not sure if you’re trolling or if you aren’t from here and want gentrification in the remaining areas of the city that haven’t been hit. I’m leaning towards trolling. I would tend to agree with you since “anon2” is another of those names that come and go, often choosing to inflame and issue then go away. But he/she doesn’t offer any real substantive reasons for wanting “skyscrapers” of all things at this site. It’s the standard rant of the uneducated about good, responsible urban planning: “make it big, make it dense, and our housing problems will be solved”. Utter stupidity and not realistic. Try telling the long time residents of this area and other similar areas that their neighborhood is an “obsolete relic”. The existing scale, demographics, transit AND the desires of the residents all must play a part in how these areas are developed. Yes, The City can grow; responsibly, carefully and respecting the past as well. Ranting about how “skyscrapers” will solve the problem is irrational and without merit. I never said I *wanted* skyscrapers, but if the demand is there for such structures, and I think it is, then I think there is no *good* reason to disallow them in such a location around a major transit hub in a major city. I’ve lived in this city my whole life, and in this particular neighborhood for over a decade. I’m tired of seeing my home town constantly falling short of its potential because of a lack of vision, and because people like you have grown so comfortable with the old world of the 20th century that you forgot there’s a whole other world on the other side of that drawbridge you would so quickly raise in the name of supposedly “responsible urban planning”. If you pretend that the world ends at the limits to your personal comfort, is that being responsible, or is it being selfish? So sorry to “inflame the issue”, but this literally hits close to home for me. As a city, we could do so much more, in this site and many others all around, but instead settle for this sort of incremental variation on mediocrity. Oh please. Stop trying to wiggle your way out. When you say “why not skyscrapers?”, that certainly implies to most people that you “want” them. Say what you mean or don’t say it at all. You’re the one who dissed the neighborhood by calling it an “obsolete relic”. You did inflame the issue without adding any substance to the conversation. And like many others here, you fall into the same tired rant of building higher will solve all the housing needs and problems. I’m a little surprised that this development would have that much parking too considering the public transportation there. Traffic is pretty bad near there already. Getting off at Geneva/Ocean in the afternoon when heading north on 280 can be bad with the traffic occupying the right lane on 280. And these people will be close to the Whole Foods on Ocean but I think it would be quicker to walk there from here. The traffic on Ocean headed that way can be a mess even for just the short distance required. It’s bad enough that I don’t bother hitting up Whole Foods after picking my kid up at Little Bear. Oh, and Little Bear is moving to 327 Capitol Ave. Little Bear rocks! Awesome place to have your kids spend time and owned by some really great people. If any of you have kids headed to preschool soon you should check them out. I won’t like the extra distance from my house to the new location but this new project is a better use of that location. And Little Bear purchased a building previously used as a church so I think that’s a good trade… one community resource replaced by another and new units built in a public transit rich location. Yeah, I forgot about that Safeway, you’re right. I live in Bernal so when I come down to that location I don’t see Mission Street south of there. Safeway will get it done for normal grocery runs and then Whole Foods can be a splurge from time to time when traffic isn’t lame. This development will be well served which again makes me question the need for so much parking. I live in the neighborhood and would absolutely support the development of this parcel for housing. San Francisco is in desperate need of more housing. This is an ideal location for housing because of it’s proximity to many transit options and a retail corridor. I wish they could also develop that awful oil change on the corner at the same time. I agree that it probably could do with less parking spaces as it’s so close to so much transit. Regarding concerns about traffic: we have to stop designing our cities around cars. Public transit will improve the more people use it and traffic will magically get better the less people use their cars for every trip they take. 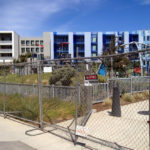 What’s the status of the “talk” of residential development of the parking lot/reservoir on the nearby City College campus? How many people commenting actually own a house in this area? If you rent, then your comment is biased and should be thrown out. You mean like the 1820’s when you had to own property to vote? Really @stev? How does that work? Renters live here too, and are affected by the good (new stores, vibrancy, housing choices) and bad (traffic, etc.) that new development brings. Why should they have less of a voice in development than someone lucky enough to win the housing lottery through inheritance or low mortgage rates? As a homeowner in the neighborhood I generally support this development. I would be a bit concerned about the number of cars given the small streets, but those can be alleviated by good design or planning (e.g. allow fewer parking spaces, or exit onto Alemany instead of Cayuga?). stev, if you have something to say about the project, just go ahead and say it. I won’t even ask for a copy of your deed. Community Service: 1) Projects located on a commercial street shall include at least 80% of the ground floor as active retail space; 2) Projects located more than 2,500 feet from a commercial street shall include at least 50% of the ground floor as active retail space and 30% as community serving uses such as child care or non-profit offices; 3) Project second floors shall be at least 20% non-profit office uses; 4) The remainder of second floors shall be community services commercial not requiring ground floor access; 5) Projects located other than 1) or 2) above, shall provide at least 80% of the ground floor for non-commercial community services. Proximity: 6) Projects shall be no more than 1,000 feet from a Muni route; or 7) Projects shall be no more than 1,800 feet from a Muni Rapid or Metro line; or 8) Projects shall be no more than 2,400 feet from a BART Station or Metro station served by two or more Metro lines; and 9) Projects shall not be closer than 500 feet to a previously approved 100 foot or taller project (any point of project to project), except that 10) Projects within 200 feet of a BART Station or Metro Station serving two or more lines or a transfer point between two Rapid lines or a Rapid line and a Metro may be no closer than 60 feet apart. Exceptions: The above height limit shall not apply to areas: that: 11) Now or by future Planning Code changes will allow for higher height limits; and 12) Sites that will inflict undo shadows per prop K on RPD open space. Open Space and Set Backs: 13) Projects shall include as a minimum matching front yard residential setbacks; 14) Projects shall provide as a minimum commercial district sidewalks of ten feet from the curb; or 15) Greater sidewalk width as required by pedestrian traffic levels; 16) Projects shall provide and deed to the Recreation and Park Department land for community open space equal to at least 30% of the project foot print; 17) Project open space shall face south and be directly accessible to the community from the street; or as an alternative 18) Project open space may be located within 1,000 feet of the project and combined with other project’s open space requirements; and 19) Other set backs shall provide minimum air space for existing adjacent residential buildings. ; 20) Required Open Space area located in the front of a Project shall include additional space required for a driveway or pavement to the front door. Environmental: 21) Project roofs shall be at least 90% solar panels; 22) Projects shall include an onsite gray water system; 23) Projects shall divert rainwater to underground aquifers unless proven to be impossible for the site. 24) Projects shall provide and maintain street trees at the curb. Affordability: 25) Projects shall include at least 20% affordable apartments, based on net square feet (with current definitions) without any additional outside support or subsidy; except 26) Projects which per 9) above are permitted to be no closer than 60 feet apart shall provide 28% affordable housing; 27) To the extent permissible by State law all newly constructed affordable housing for those earning less than 40% of the mean income shall be permanently added to the SF Rent Control roles; and 28) Any rent controlled apartments removed by a project shall be added back to the rent control roles in addition to 25( 26) and 27) above. Housing Distribution: Net housing area shall be: 29) Three bedroom or greater 15% minimum to 20% maximum; 30) Two bedrooms 20% minimum. Parking: 31) Projects shall not provide more than 0.50 off street parking spaces per two bed room or larger units or more than 0.25 spaces per one bed room or smaller units; 32) Project total parking per 31) above shall be inclusive of any off-street parking provided for car share companies; 33) Residents of projects within a Residential Preferential Parking permit area shall be excluded from obtaining a permit. Termination: This ordinance shall be in effect until it causes to be built 34) a total of 38,000,000 net square feet of housing unless extended by vote of the people or the Board of Supervisors. Verification: 35) Every five years the Planning Department shall determine the total number of apartment units in each district along with the number affordable and rent controlled apartments. Good luck “Howard” with this one. Basically full of so many ridiculous restrictions and personal biases, this is sure to fly thru easily with the BOS, the Planning Commission and the public. Oh, sorry, I’m being only slightly sarcastic. High-rise housing needs to be on top of Balboa Station and the that entire mess of an intersection at Geneva and San Jose should be revamped. Housing should be on top of Daly City BART Station, too. Couldn’t agree more! How about the muni yard right next to the Balboa BART Station? It seems like a no-brainer that this area would be completely rethought and developed. The design is good, and better than what is across alemany st. so going up extra floors should still be a palatable design. Street frontage will need to improve with the removal of the corner tire-shop, and a new proposal there to improve the “corner” design. This could be the impetus for a better connective pedestrian route from Mission to the Balboa Park Station! Ensure street shopping, and improved retail! maybe even the daycare if they go up 2-4 floors on the white portion and 1-2 floors on the lower base area… looks good! Actually (3) roles, one as BPSCAC member, the other as neighbor and D11 resident, third as member of SFT (San Francisco Tomorrow) board member. We are looking into the issues of pressuring the changes with actions that we can do, with the Balboa Station Area Plan, unfortunately most of the efforts are on the Balboa Reservoir and CCSF issues, but not on the eastern side of the station, where we could really see some pro-active addressing of urban planning by the SF Planning Dept, and inter-agency coordination like the proposal for the parking zone with MOHCD and the future Geneva Car-Barn, some items are set in stone, others are being pushed for change, like improved coordinated efforts between agencies in terms of projects and street/scale design. In what ways would you like to change the Balboa Station Area Plan, and have you attended some meetings or looked at joining the discussion as a BPSCAC member? Not sure in what way’s you are stating we are “not interested in implementing the BPS Area Plan…” Please elaborate or attend the meetings upcoming and discuss with us in person. 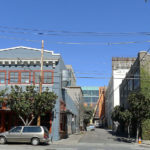 Personally I would love to see improved walkability and design, development along the Ocean connection between Ocean Ave and Mission St. as it is currently a dead-zone, and only the recent community well, and bookstore are positive moves with two developments done without ground-floor retail..
Not that it should matter, but I’m a home owner in Mission Terrace. AND I support development of this property. I have to say I am in support of the idea of this project. We definitely need the housing. I am concerned that we have too much “ground floor retail” sitting empty at many of our newer residential buildings. Is there some other way, besides shops/retail, to animate the ground floors of the building? 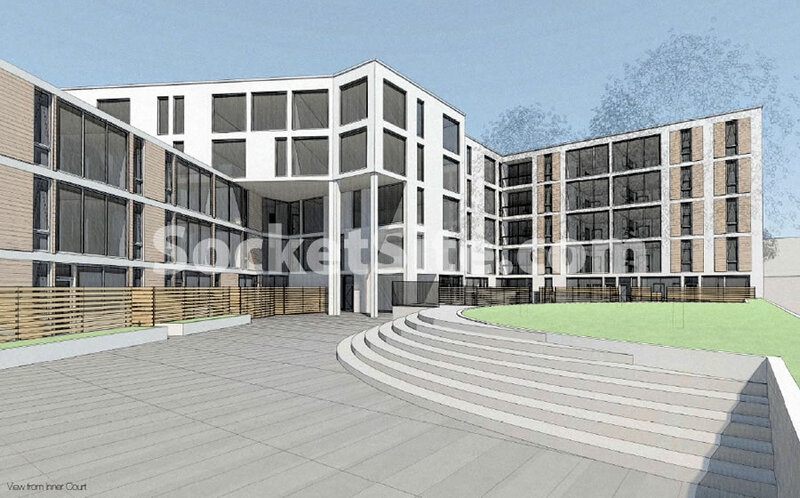 Also – side note, am I the only one that thinks this preliminary design looks like an institutional dormitory building? Good point on ground floor retail. So many of the new developments w/ such have them sit empty. From King Street to the SOMA condo towers – to the stretch of Ocean between Phelan and 19th. IMO there is too much ground floor retail being built at a time when there is a huge switch to on-line shopping. How to animate the ground floor? Maybe have “townhome” units at the ground floor w/stoops in some of these developments? @Aaron: I have attended many meetings and talked to many of the current members and I have made several public comments. That experience is the basis for my poor opinion of your committee. The neighborhood was promised many things when the meetings for the Balboa Plan started almost twenty years ago. We’re still waiting for any significant improvements. Instead BART and Muni seem to be competing with each to see who can do the most to make the area worse. Meanwhile the MOHCD is now committed to build housing for the homeless on the Upper Yard, with supportive services on the ground floor. That should really improve the neighborhood. I hadn’t checked what your committee’s been up to lately but, checking the recent meeting materials, I see you’ve been keeping busy passing multiple resolutions against jaywalking. Keep up the good work. This is too small! Every project should be maxing out what is allowed, especially market rate where there is no reason not to, how else is the market ever going to get under control? Just because you have a car, doesn’t mean you won’t take mass transit. Maybe some of them want to get out of the city on the weekend. I am not opposed to this project. I grew up and continue to live in this area, this is an upgrade. My requests are make the sidewalk larger and include bike parking. As for the car concern, this part of SF, it is customary to own many cars and find ways to cheat pedestrian safety by blocking the sidewalk. Drive down this stretch of Ocean Ave after 7pm. Please make sure the people moving in are not going to clog the streets further somehow. On another subject, wouldn’t mind seeing permit parking throughout the area. How can such a small project makes sense on this site? Sad to see such an unsustainable, low density attitude prevail in this city. How did such a progressive city adopt such selfish attitudes? I live within a block of this proposal and there is another proposal right next door to this one with garage access on Cayuga as well. The planners need to think about making 2 large density building use the same tiny residential street to access the garage. Keep in mind that the garage will house bikes, scooters, and yes cars. There is very limited freeway access in this area (1 lane, 6-8 cars per green light) for either the entry or exit ramps. We have people zipping down our streets already at alarming speeds and would expect that speed controls should be installed (speed bumps, roundabouts, etc.) to control traffic. With this building having commercial space on the ground floor, they must provide parking for the businesses off street as parking is already limited here. Lastly, for now, why can’t they build something that is more fitting of the neighborhood vs. being so ultra-modern? I’m not opposed to ultra-modern, but the facade should at least be somewhat fitting of the area. There is a gorgeous art deco/former PacBell building, Balboa High School, and other such historical spaces and it would be nice to have something this large in a relatively low height area look like it belongs.